Anti-Allergy Pillows Super Soft Hollow Fibre ..
Economy Pillow with polypropylene cover. Appr.. Duck feather and Down filling. Polycotto..
Polycotton Cover. Approx. 650g. (22.5oz) best.. 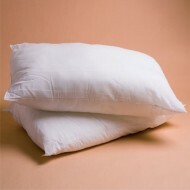 Pure Soft Quilted Cover Pillows Hollow Fibre ..